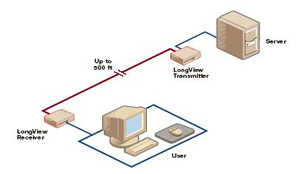 The Avocent LongView LV420-AM extender extends a keyboard, monitor, mouse, speakers, microphone and serial port up to 500 feet away from your computer. You can improve physical and data security and increase working space by separating your staff from their computers. The Avocent LongView LV420-AM extender allows you to place connected computers up to 500 feet away with any UTP cable and still have control of your keyboard, monitor, mouse, speakers, microphone and serial devices. Question: Does this allow for local AND remote viewing with VGA monitors? Answer: Thank you for your inquiry. This discontinued extender does not have a local console port, so would not allow local viewing of the VGA monitor.